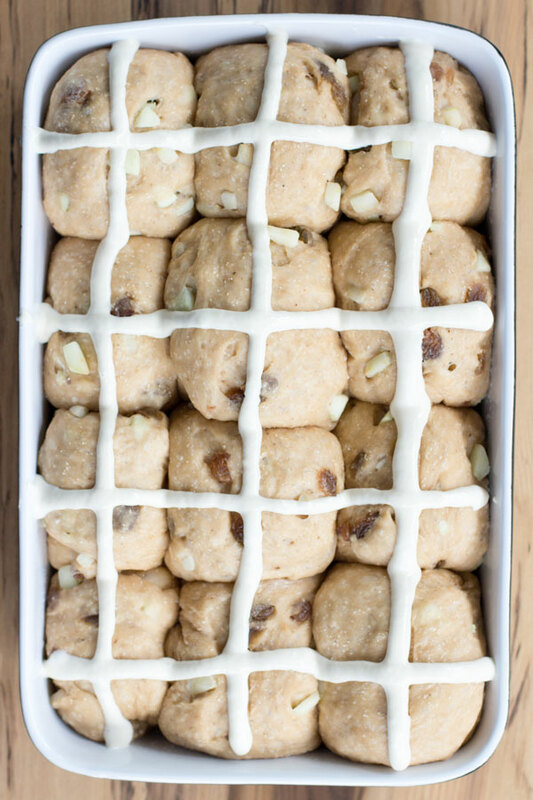 Hot cross buns are a must at Easter time. Traditionally we eat these tasty spiced buns on Good Friday, however, each year they are available to buy in the shops earlier and earlier (the supermarket chains roll them out straight after Christmas is over). 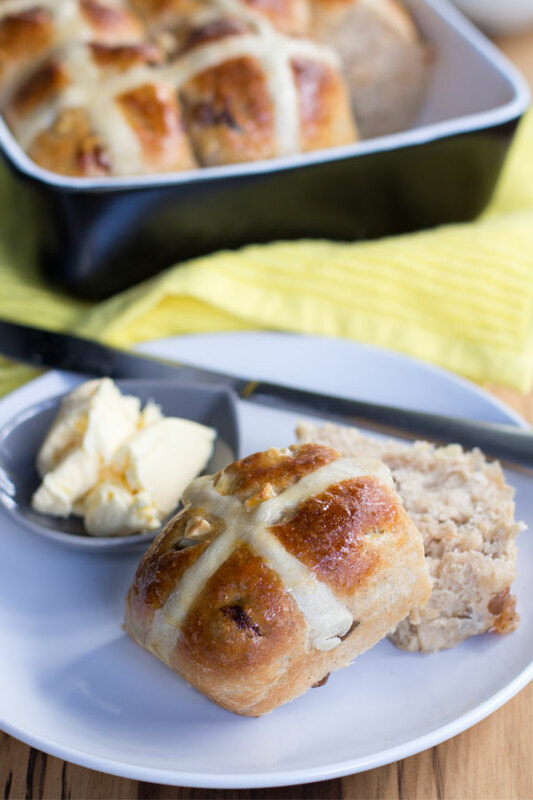 Apple and sultana hot cross buns provide a new twist on an old favourite. Traditional hot cross buns are usually made with currants or raisins and flavoured with mixed spice. 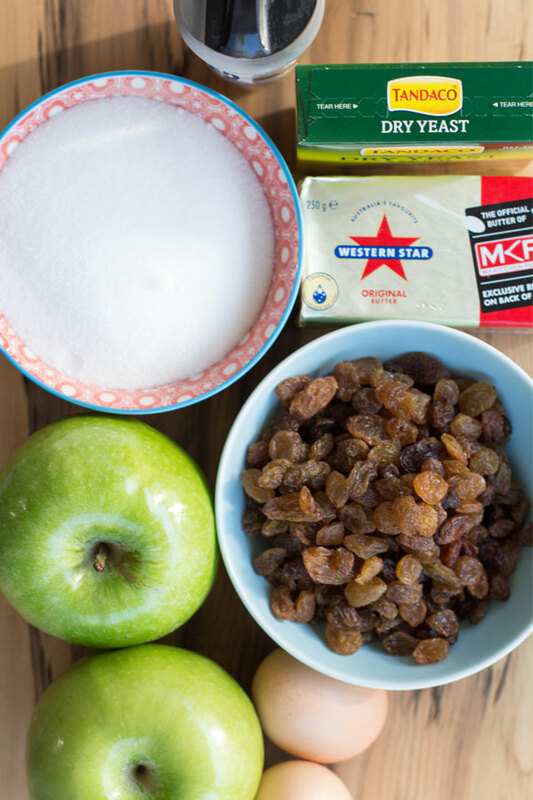 To make our recipe we used granny smith apples and sultanas to add a new twist on the classic recipe. I like my hot cross buns spicy so Brooke added an extra tablespoon to this recipe. Baking these treats the delicious smell of mixed spice filled the apartment. After making the dough, letting it rise, kneading it again, and dividing it into your buns. You need to let to dough rise once more in the baking dish before adding the traditional flour paste lines as crosses on the dough. After all this, bake your buns in a moderate oven for around 30 minutes or until cooked through. To give the buns a nice glossy finish you need to make a simple glaze. Heat a few tablespoons of apricot jam in a bowl in the microwave for a few seconds until runny and then brush over the hot cross buns with a pastry brush. These apple and sultana hot cross buns are a delicious treat, perfect for breakfast or a snack with a cup of tea. If your looking for another twist on the traditional hot cross bun then try our cranberry and apricot hot cross buns. 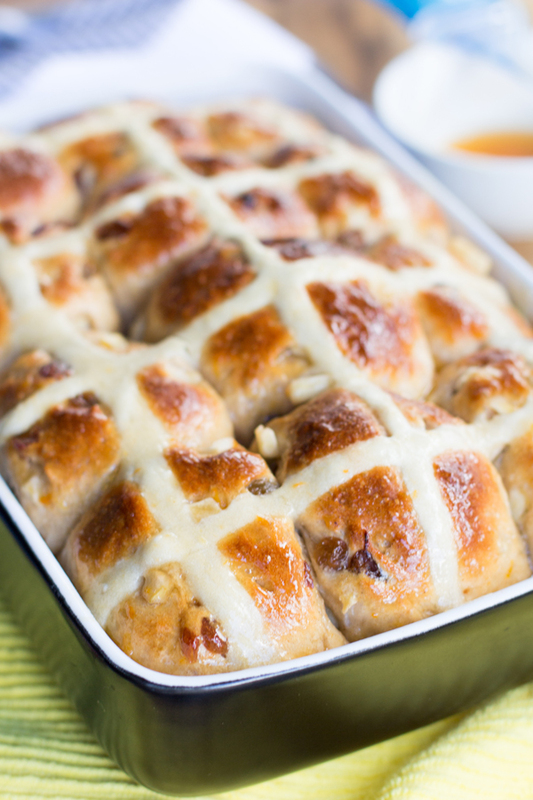 Check out this recipe for rustic hot cross buns made with mixed spice, apple and sultanas. Combine flour, yeast, sugar, mixed spice, salt and apple and sultanas in a large bowl. Melt butter in a small saucepan over medium heat. Add milk. Heat for until lukewarm. Add warm milk mixture and eggs to fruit mixture. Using a flat-bladed knife, simply cut the knife through the dough until it almost comes together. Using clean hands to finish mixing to form a soft dough. Turn dough out onto a floured surface. Knead for 10 minutes, or until dough is smooth. Place into a lightly oiled bowl. Cover with plastic wrap. 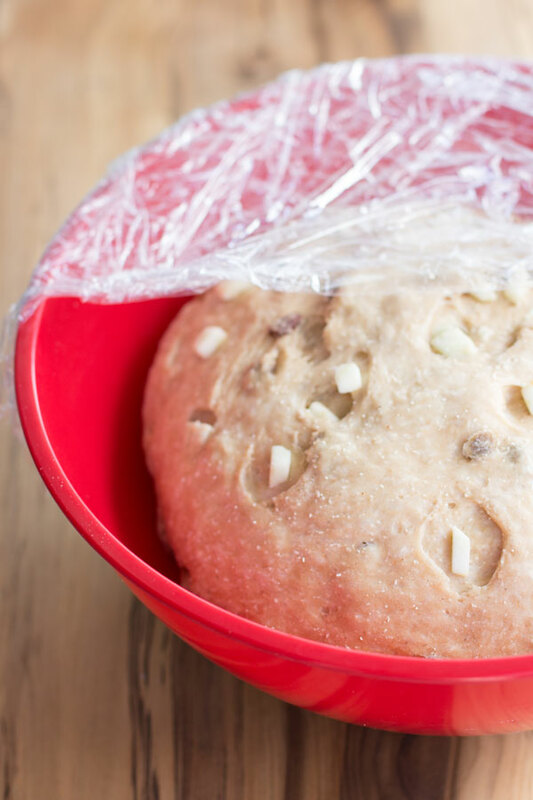 Set aside in a warm, draught-free place for 1 to 1½ hours, or until dough doubles in size. Line a large baking tray with non-stick baking paper. Punch dough down to its original size. Knead on a lightly floured surface until smooth. Divide into 12 even portions. Shape each portion into a ball. Place balls onto lined tray, about 1cm apart. Cover with plastic wrap. Set aside in a warm place for 30 minutes, or until buns double in size. Make flour paste: Mix flour and water together in a small bowl until smooth, adding a little more water if paste is too thick. Spoon into a small snap-lock bag. Snip off 1 corner of bag. Pipe flour paste over tops of buns to form crosses. Bake for 25 to 30 minutes, or until buns are cooked through. 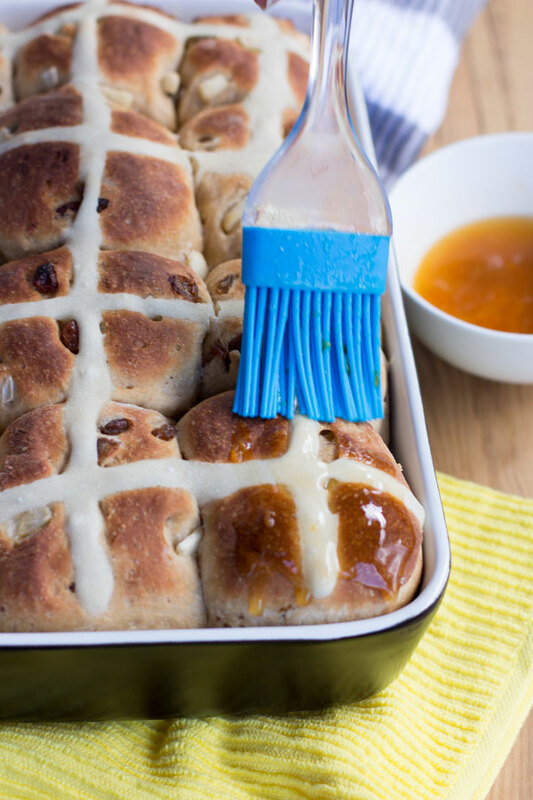 Make glaze: Heat a few tablespoons of apricot jam in a bowl in the microwave for a few seconds until runny and then brush over the hot cross buns with a pastry brush.